riverrun, past Eve and Adam's, from swerve of shore to bend of bay. Ours was the marsh country, and from the strand I climb to the marsh gate, and there across the wide marshes stands All Saints. 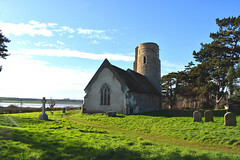 Here, thousands every year see Ramsholt church for the first time, and every time is like the first time. Now, I step out across the marshes, and in my mind I am Dickens's Pip, I am Joyce's Dedalus; signatures of all things am I here to read. 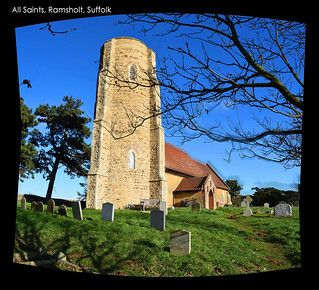 A bright, freezing day in January 2017, and a perfect day for cycling out to Ramsholt church. I caught the Lowestoft-bound train to Melton, and then cycled out along the long, rolling, busy peninsula road, the traffic quietening as it peeled off to larger, less remote places. The fields flattened out, punctuated by wind-swept pines. The lanes narrowed, zig-zagging down the sides and along the ends of pre-enclosure strips. A sea of mud and ice caked the road surface, and soon almost every trace of human habitation had disappeared. Curlews and oyster-catchers huddled miserably in the open fields as I reached the end of the long lane which leads up to Ramsholt church. 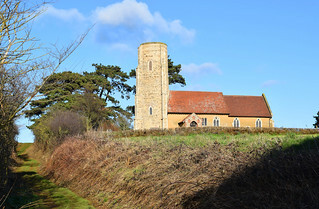 Hardly anyone lives in this parish, but it still maintains a service a month as a result of the Anglican diocese's benefice system. 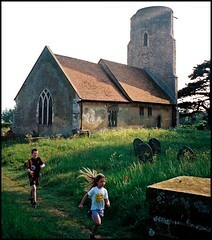 Although this church is just about accessible by car, most people who visit here will come on foot. This is because, just beyond the lane that leads to the church, another lane leads down to the pub on the quayside, the Ramsholt Arms. Today, this pub is one of the busiest in Suffolk. It hasn't always been so; When I moved to Suffolk thirty years ago you could come here on a sunny day and enjoy the silence of the shoreline as you sat behind your pint of Adnams. It was considered by those who knew of it one of the best kept secrets in the county. A peaceful, laid-back pub overlooking the wide river - what more could you want? The food was superb, and you could be assured of the friendliest of welcomes. And then came the 1990s, and Suffolk was 'discovered'. It is hard to remember now just how unfashionable it had been before. As recently as 1986, Michael Palin could make a comedy film, East of Ipswich, about going on holiday with his parents in the years after the War to Southwold. Southwold! How absurd! Who would ever want to visit such a backwater, let alone go on holiday there! Nowadays, it is hard to pick up a colour supplement without finding an article about some actor, or designer, or investment banker who has a holiday cottage near the mouth of the Deben or the Blyth. Foodie articles focus on Suffolk produce and Suffolk restaurants. House prices have rocketed; it simply isn't possible for young locals to live here any more. A beach hut recently exchanged hands in Southwold for about the same as my house in the middle of Ipswich is worth. 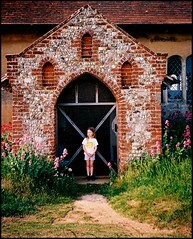 And places like Ramsholt are becoming overwhelmed. From being a quiet haven where you took your mum for lunch when she visited, the Ramsholt Arms has become a tourist pub, its large garden full on a summer's afternoon with yachting types up from London for the weekend. Does this sound snobbish? I'm sorry. But you might as well be in Southwold or Aldeburgh. I am seeing my lovely Suffolk destroyed, and it seriously pisses me off. A large field has been converted to a tourist car park about half a mile before you reach the pub. You walk down onto the strand; although we are a good three miles from the sea, the beach is sandy, and children dig holes and build castles. The lazy river is shallow and slow, if a touch muddy, and paddling is certainly safer than it would be a couple of miles downstream at Bawdsey. The tide is very dramatic; at the turn, it retreats a hundred yards out in less than twenty minutes, leaving a vast expanse of shiny mudflats, an aerodrome for the seagulls. You wander along the strand upstream, taking care not to step on the samphire that grows there - I'll be along in the spring to harvest some of it, and I don't want it all trampled, thank you very much. You step up onto the level above, and through a gate onto the bridleway through the marshes. And you see the church for the first time. From across the reeds, it rises dramatically above you. The round tower appears square at this distance, but as you come closer it begins to look oval, an illusion caused by the buttressing. 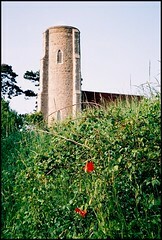 A similar illusion occurs at Beyton, Suffolk's other buttressed round tower. 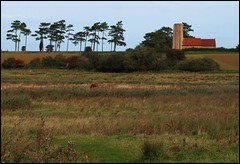 The bridleway winds leisurely across the flat marsh. But it is best to keep to it; deep channels snake among the reeds and gorse, and only the brown cattle that somehow find something to graze here seem sure of not falling into them. If you have come here in spring, you are in for an absolute delight when you pass through the gate on the far side of the marsh. 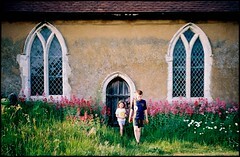 Here, a sunken lane winds up to the church. Until fifty or so years ago, these were so common, but most were either turned into roads, or allowed to return to nature. 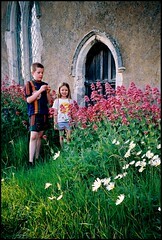 This one is lined by high banks, six feet or more, and they are a riot in spring of wild flowers and grasses. Poppies spangle them into the distance. The lane climbs, and suddenly you reach the churchyard. It is about eight feet above you, and you can either continue up to the field and around to the north east, or there is a little stairway cut in the bank of the sunken lane. This takes you up into the graveyard itself. It would be silly to call this a lonely place, because it has thousands of visitors every year, and unless you come in deepest winter as I did, you cannot be here for long without someone else turning up. 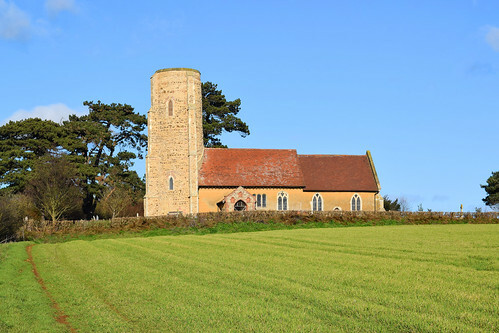 But it is lonely in the sense that it is virtually all there is under the sky, apart from an impossibly pretty thatched farmhouse down in the dip beneath the church. The river stretches beyond the marshes (you can just make out the spire of Felixstowe St John on the horizon, some six miles away) and the air is empty except for plaintive bird cries and the wind in the reeds. On a hot, still day, even these are silenced, and you'll swear you can hear the distant clink of boat masts in the river, half a mile off. This is an ancient place. There was a church here a thousand years ago, and perhaps the base of the tower survives from that time. 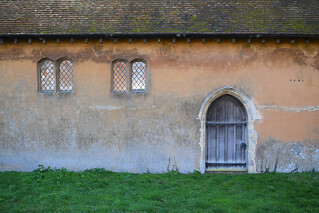 The church is broadly Norman; the later medieval windows can't disguise this. North and south are strange sets of dumpy lancets, which could date from any time, I suppose. They allow you to see how thick the walls are. However ancient All Saints is, the strongest resonances here are of the 18th century. 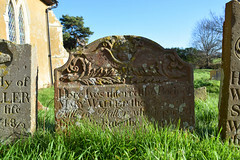 This seems to be the last time the Parish was populated to any extent, and there are some superb 18th century headstones set in the wild grasses, including one with a sexton's tools. My four favourites are in a line, to the Waller family. 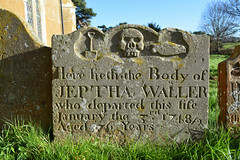 The Wallers can still be found locally; they owned the living at nearby Waldringfield and presented their sons to the living. 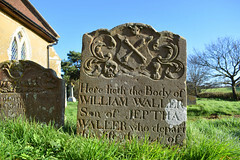 The last Waller rector of Waldringfield died in harness as recently as 2013. 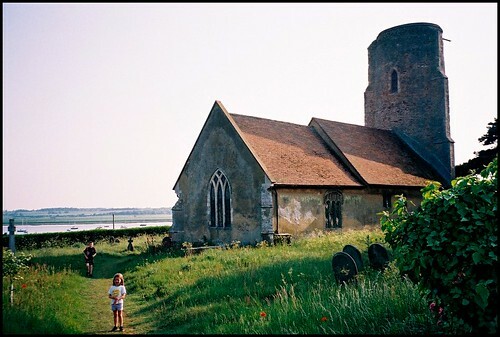 The location and pre-Tractarian character of the graveyard and church meant it provided a perfect setting for a recent BBC adaptation of Charles Dickens's Great Expectations (although the book is actually set in the north Kent marshes, of course). Curiously, there are hardly any stones to the north of the church. 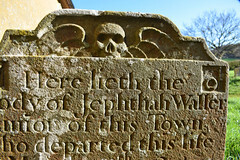 This may be used as evidence for the myth that people are never buried on the north side of churches (in practice, they are - take a look at a few churchyards!) 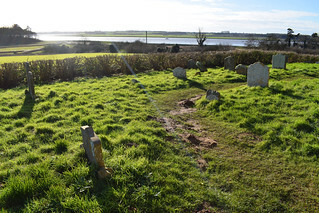 but I think it is simply that people here have chosen to be buried looking over the river - well, you would, wouldn't you. 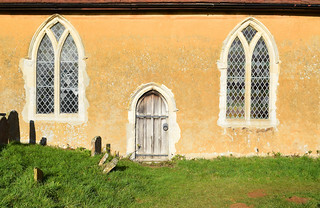 As you step through the 19th century porch (the frontage is most unusual; bricks lining unknapped flintwork, like a seaside cottage) and into the open church (it is always open) you might be forgiven for thinking that the interior is also an 18th century survival. 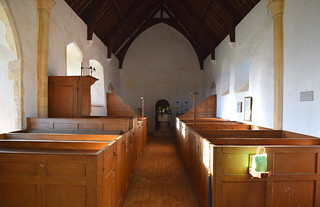 There are simple wooden box pews, a brick floor, a two-decker pulpit rising on the south side. It is all just about perfect. In fact, all of this is the result of a restoration of the 1850s. 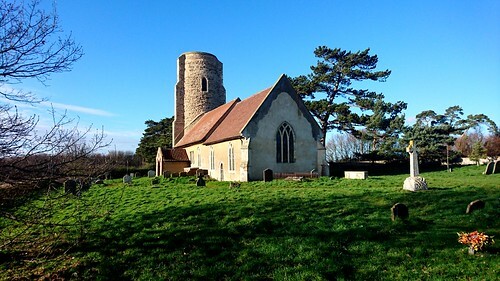 In the first half of the 19th century, Ramsholt church was derelict; unused and unloved. 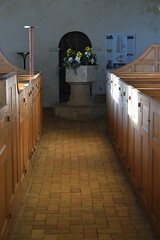 The nave was open to the sky; the walls were 'green with damp'. 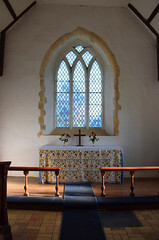 It seems extraordinary that a church would be furnished in the prayerbook fashion at such a late date, although it probably reflects the predilections, and memories, of elderly churchwardens. 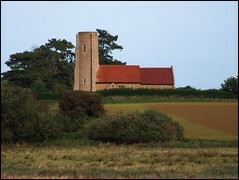 Ramsholt is such a backwater that this was still thought to be the proper manner of furnishing a church. 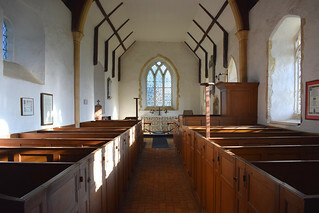 As you walk up to the altar, you'll notice that the seats face west, towards the pulpit, rather than east, towards the altar, a reminder that for 300 years it was the Word that was the focus of Anglican worship, not the Sacrament. 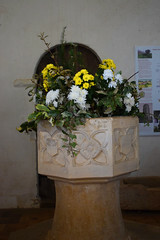 There's a nice late medieval font, which seems rather out of place here; you feel that a chunky Norman font, or one of those 18th century bird baths as at neighbouring Bawdsey, would be more appropriate. 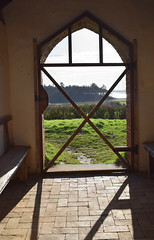 The simple Norman doorway into the tower seems to call out for the former. 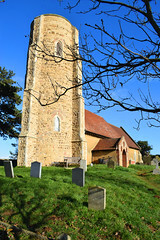 If you look through the cracks in the door, you'll see that the base of the tower has been furnished as a vestry. The damp of the estuary inevitably creeps into this building still, but that is part of its charm. 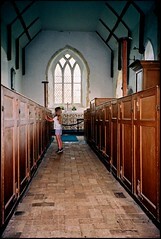 On a summer's day it is cooler inside than out, as if the church were holding on to the grip of winter. On a winter's day the church becomes a sanctuary, but in all seasons a serious house on serious earth... the ghostly silt not yet dispersed. 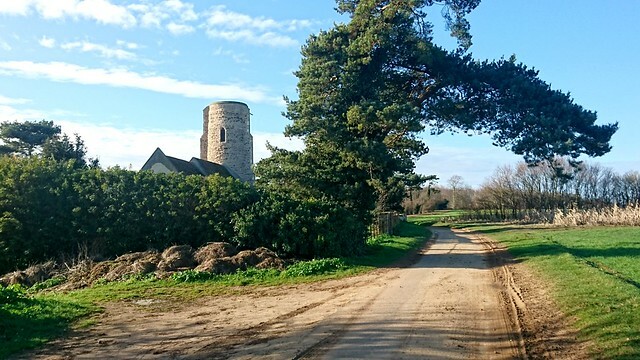 There is something organic about this great oatmeal tower, and the way it and the sandy bluff merge into the reeds and pines above the Deben estuary, at one with its setting, its parish and its long generations. And that is all there is to Ramsholt now. 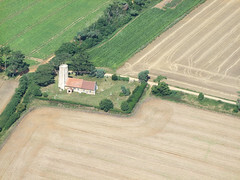 The pub, a farmhouse and the church, each about half a mile apart. And the marshes, and the water, and the wide Suffolk sky.